If the amount of supercar crashes continues like in the first five months of 2009, it will have been a very bad year for the word of exotic cars. Only yesterday we showed you some pictures of an Audi R8 crashed into the back of a Ferrari 599 GTB Fiorano and today’s picture shows a crashed Mercedes McLaren SLR. 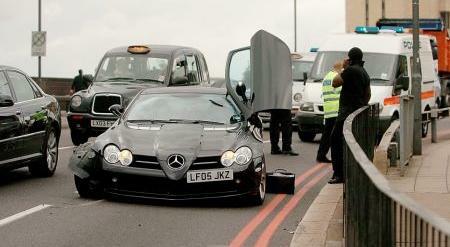 Story goes that a delivery driver crashed the SLR as he drove it from a private collector place to a supercar show in London.